Who isn’t immediately attracted to the bright colors, crisp lines, and repetition in Andy Warhol’s artwork? Not to mention the fact that Warhol himself was such a character, playing with the art world, celebrity, and fame. One of Warhol’s most iconic images, that of the Campbell’s Soup Can, is now available for mass-market purchase. For 75 cents. That’s right. 75 cents for your very own piece of Andy Warhol art history! Okay, I’m dramatizing a little bit here. There’s tomato soup inside that Warhol artwork. 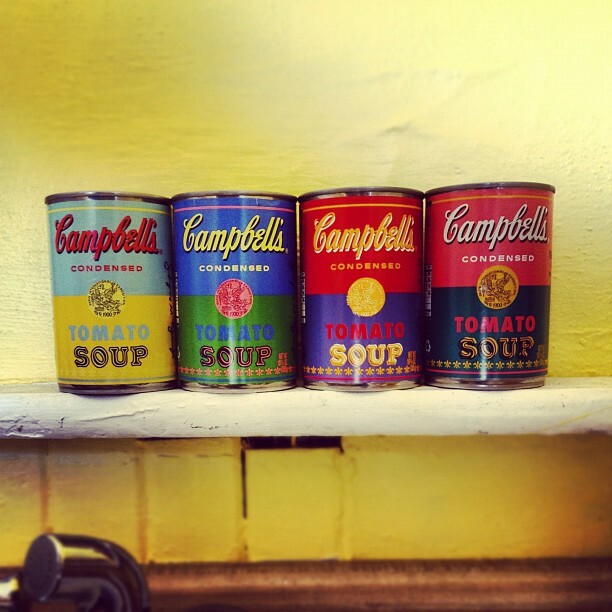 By which I mean, Campbell’s Soup has released limited-edition cans of their tomato soup printed with Warhol’s Campbell’s Soup design. You can buy them at your local Target. And, of course, you can visit the original Campbell’s Soup (see above) right here at the Museum, in Gallery 19 on the Main Level. If you’d like to spend a little more for your Warhol fix, and you need to round out your beauty collection, well, there are plenty more limited-edition Warholian goodies for you to purchase. I’ve known for a while about Andy Warhol-scented perfume (yes, you read that right), but now there’s even Andy Warhol lip gloss! My 16-year-old little sister, who is very in-the-know about all things makeup related, knows of my art obsession and texted me a link to this limited edition set of NARS lip glosses inspired by Andy himself. Then she informed me that not only will there be lip gloss but a whole set of Warhol-inspired makeup, including eye shadow palettes pressed into a pattern based on his Flower lithograph, and nail polish shades inspired by colors used in his prints. James Warhola, Uncle Andy’s (2003). If this is all a little overwhelming to you, too, maybe we should turn to something a bit more educational than eye shadows. 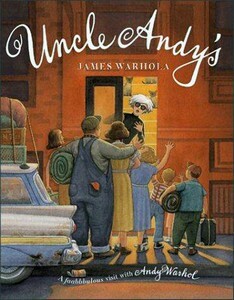 Andy Warhol’s nephew, James Warhola, wrote a great picture book, Uncle Andy’s, about his childhood visits to his famous uncle’s apartment in New York. Educators here love to use this book for Story Time in the Galleries. I don’t know about you, but stunned though I am with the overload of Warholian goodies, I am totally game for a fall full of Andy Warhol. Bring on more art in my day-to-day life! PS: If you’ll be in New York City anytime soon, the Metropolitan Museum of Art is also getting in on the autumn Warhol trend with an exhibition called Regarding Andy Warhol: Sixty Artists, Fifty Years, all about Warhol’s artistic influence. PPS: If you’ll be in Pittsburgh, visit the Andy Warhol Museum and recreate the artist’s process for filming your own Screen Test. This entry was posted in Art, Art News and tagged Andy Warhol, Campbell's, Consumerism, Soup. Bookmark the permalink.